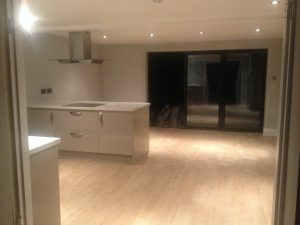 Kitchen Done, But What About The Bathroom? 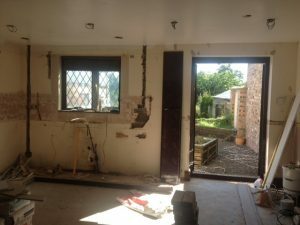 The kitchen has well and truly had a makeover and those who know me well will already have read how thrilled I am with the new bi-folding doors which frame the Shropshire landscape beyond the house beautifully. What you will be surprised about is that I’m a bit disappointed I’m finished. Yes, finished. Thing is, Tile Mountain have got a competition running where you can win tiles for a bathroom or a kitchen. To be fair, even though I have the bathroom still to do it would have been nice to have done both, the amount of tiles they’ve got! 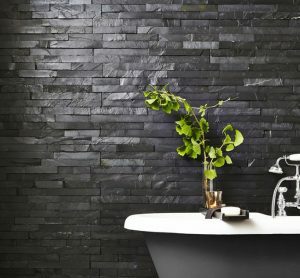 So, with one room left which needs more than a little TLC and I’m talking Tiles Looking Cool – as well as Tender Loving Care – I thought I’d get some inspiration from Tile Mountain. Plus I need no excuse to create a new Pinterest mood board or two although it will be the virtual death of me. One click then leads to hours of my life zapped but many dreams born! See below, the virtual maze led me to my perfect bathroom tile mood board. An eclectic mix of Nordic-style patchwork tiles and muted sophisticated palettes to sooth away even the most shocking of days! 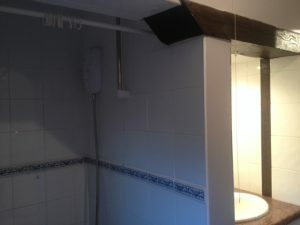 If I’d thought about the renovation more I should have got the bathroom done first – it is after all the room where all the stresses of renovations can be washed away! Follow Renovate Me’s board Bathroom Makeover on Pinterest. So, onto the room itself. The shower room is part of the original cottage and is solid wall construction so we can assume pre 1919. It has a beam running through part of the room and is a strange configuration with limited natural light. However someone has utilised the area over the stairs by creating an enclosed sink area. 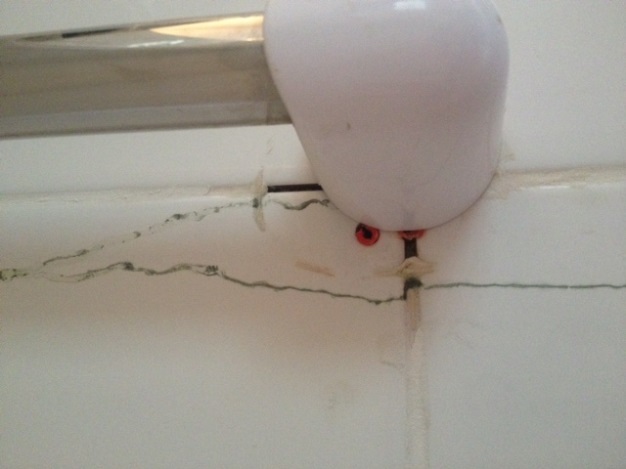 But the mystery is how to access the taps, as the whole sink area is enclosed, I think I’m going to need to smash through the existing tiles and wall to get the sink out – sounds fun! At best the tiles are white and boring, the shower tray has seen better days and the mosaic linoleum was presumably the height of bathroom fashion at some point, but certainly not now. 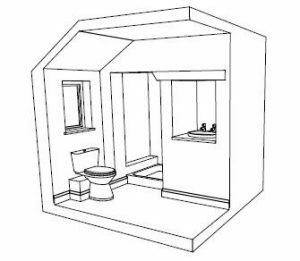 The room would benefit from becoming a wet room and tiled floor to ceiling. Matthew Miles of HLP UK Ltd who specialises in 3D technology kindly created a 3D visual to show the room configuration. of only 3.68 m² so I focused my attention on a smaller, lighter colour but still keeping a rustic, rural style which the cottage demands. However, my final go to is the Craquele wall tile, a smaller tile with a sense of high end class and allows for various tones to be used. I would select Dove and Lead. The unevenness of the tile gives it the rustic feel I’m looking for, but the gloss lends the room more light than a matt finish would and also highlights the original beam running through the room. 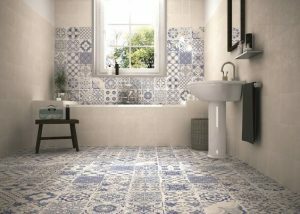 And to finish, I’d introduce a splash of bohemia by way of the beautiful Skyros Delft Grey tiles. The matt, patchwork pattern is an excellent foil to the gloss, rustic wall tiles and the whole effect oozes oceans of charm without being too bijou. If you too are considering a bathroom makeover, I hope you have found some inspiration. Good luck to everyone who enters the Tile Mountain competition. Previous Post Property Tax: Will your profits be subject to income or capital gains tax? Next Post Are you buying contaminated land?